Size: Width - 75" (190 cm), depth - 35.5" (90 cm). Needles: 10 (6.00 mm) OR SIZE NEEDED TO OBTAIN GAUGE. 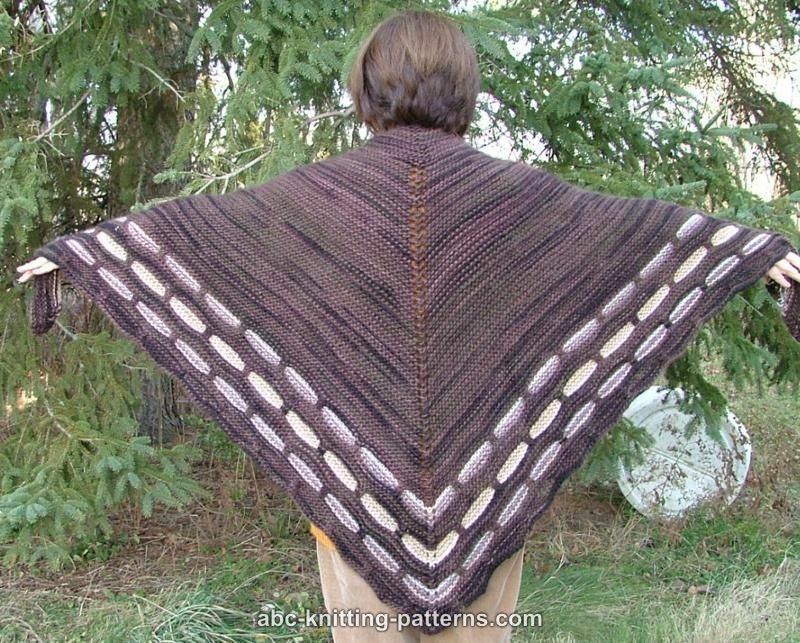 With yarn (A) cast on 7 sts. To make a firm edge always slip the 1st stitch and purl the last st.
Row 1: sl 1, k1, yo, k1, yo, k1, yo, k1, yo, k1, p1. Mark the 4th st with the stitch marker. 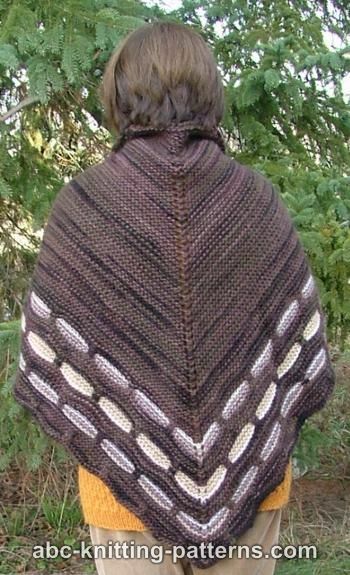 This is the center of the shawl. Row 3: sl 1, k1, yo, k3, yo, k1, yo, k3, yo, k1, p1. 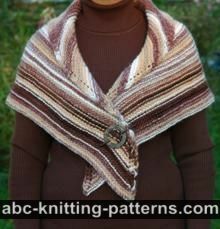 Continue to increase the shawl with 4 yos in every odd row: after the 2nd st, on both sides of the central st and before the 2nd to last sts of the row. Work 108 rows. Total sts = 223 st.
Row 110: sl 1, k7, * sl 2 wyif (with yarn in front), k10*, repeat 8 times, sl 2 wyif, k15, * sl 2 wyif (with yarn in front), k10*, repeat 8 times, sl 2 wyif, k7, p1. Row 112: sl 1, k8, * sl 2 wyif (with yarn in front), k10*, repeat 8 times, sl 2 wyif, k17, * sl 2 wyif (with yarn in front), k10*, repeat 8 times, sl 2 wyif, k8, p1. Row 114: sl 1, k9, * sl 2 wyif (with yarn in front), k10*, repeat 8 times, sl 2 wyif, k19, * sl 2 wyif (with yarn in front), k10*, repeat 8 times, sl 2 wyif, k9, p1. 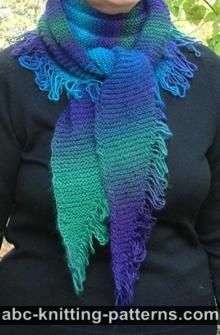 Rows 115-122: with yarn A, garter stitch, increasing for 4 sts in each odd row. Total = 251 sts. Row 124: with yarn B: sl 1, k8, * sl 2 wyif (with yarn in front), k10*, repeat 9 times, sl 2 wyif, k17, * sl 2 wyif (with yarn in front), k10*, repeat 9 times, sl 2 wyif, k8, p1. Row 125: with yarn B: sl 1, k1, yo, k7, *sl 2 wyib (with yarn in back), k10*, repeat 9 times, sl 2 wyib, k8, yo, k1, yo, k8, *sl 2 wyib (with yarn in back), k10*, repeat 9 times, sl 2 wyib, k7, yo, k1, p1. Total = 259 sts. Row 126: with yarn B: sl 1, k9, * sl 2 wyif (with yarn in front), k10*, repeat 9 times, sl 2 wyif, k19, * sl 2 wyif (with yarn in front), k10*, repeat 9 times, sl 2 wyif, k9, p1. Row 127: with yarn B: sl 1, k1, yo, k8, *sl 2 wyib (with yarn in back), k10*, repeat 9 times, sl 2 wyib, k9, yo, k1, yo, k9, *sl 2 wyib (with yarn in back), k10*, repeat 9 times, sl 2 wyib, k8, yo, k1, p1. Total = 263 sts. Row 128: with yarn B: sl 1, k10, * sl 2 wyif (with yarn in front), k10*, repeat 9 times, sl 2 wyif, k21, * sl 2 wyif (with yarn in front), k10*, repeat 9 times, sl 2 wyif, k10, p1. Rows 129-136: with yarn A, garter stitch, increasing for 4 sts in each odd row. Total = 279 sts. Row 137: with yarn B: sl 1, k1, yo, k7, *sl 2 wyib (with yarn in back), k10*, repeat 10 times, sl 2 wyib, k8, yo, k 1, yo, k8, *sl 2 wyib (with yarn in back), k10*, repeat 10 times, sl 2 wyib, k7, yo, k1, p1. Total = 283 sts. Row 138: with yarn B: sl 1, k9, * sl 2 wyif (with yarn in front), k10*, repeat 10 times, sl 2 wyif, k19, * sl 2 wyif (with yarn in front), k10*, repeat 10 times, sl 2 wyif, k9, p1. Row 139: with yarn B: sl 1, k1, yo, k8, *sl 2 wyib (with yarn in back), k10*, repeat 10 times, sl 2 wyib, k9, yo, k 1, yo, k9, *sl 2 wyib (with yarn in back), k10*, repeat 10 times, sl 2 wyib, k8, yo, k1, p1. Total = 287 sts. Row 140: with yarn B: sl 1, k10, * sl 2 wyif (with yarn in front), k10*, repeat 10 times, sl 2 wyif, k21, * sl 2 wyif (with yarn in front), k10*, repeat 10 times, sl 2 wyif, k10, p1. Row 141: with yarn B: sl 1, k1, yo, k9, *sl 2 wyib (with yarn in back), k10*, repeat 10 times, sl 2 wyib, k10, yo, k 1, yo, k10, *sl 2 wyib (with yarn in back), k10*, repeat 10 times, sl 2 wyib, k9, yo, k1, p1. Total = 291 sts. Row 142: with yarn B: sl 1, k11, * sl 2 wyif (with yarn in front), k10*, repeat 10 times, sl 2 wyif, k23, * sl 2 wyif (with yarn in front), k10*, repeat 10 times, sl 2 wyif, k11, p1. Rows 143-148: with yarn A, garter stitch, increasing for 4 sts in each odd row. There are 11 total comments on this article. Row 1 has three lines of insruction. Row 2 and all even rows are knit rows. If you open a word document and then highlight the instructions, right click, and copy then paste onto your document. If you catch any of the ad you should be able to delete the pictures and text. When I did it I caught up the picture of the ad and it did not paste with the instructions. The gauge is 12 st x 24 rows = 4" x 4" (10 x 10 cm). 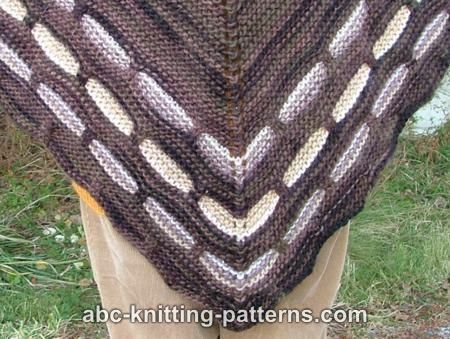 To make the shawl smaller, start the border after row 100or even earlier. Thank you so much for this wonderful pattern. 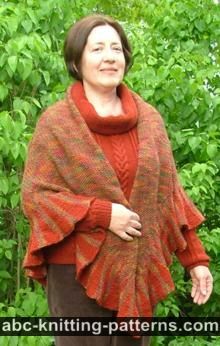 It is just perfect for the wool I have on hand and will be absolutely lovely to cuddle up in this winter. I was so pleased to have found it!! You have made my day!! Thank you again...you are super!! Do you increase in rows 115-117? It really looks great tho!